Once a flourishing industry, Kashmir's gunsmiths have seen their trade being reduced to naught by militancy and an apathetic government, writes Haroon Mirani. Zahoor Ahmad Ahangar is one of the last members of the small tribe of gunsmiths in Srinagar, whose history of gunmaking stretches over two centuries. Zahoor's ancestors settled in Kashmir after they migrated from Hazara in Afghanistan in the 18th century. Skilled in weapon making, the then king of Kashmir granted them permission to make knives, daggers, arrows, swords. As technology progressed, Zahoor's forefathers too continued to upgrade their knowledge and skills. Starting with daggers and arrows, they slowly graduated to doling out single and double barrel rifles. Every new product of theirs was received with huge applause. Already known for their magnificent handicrafts, the gunsmiths incorporated intricate craftsmanship into the robust guns. Gun-butts made of special wood with minute carvings or the special iron that used to come from Yousufzai on the Afghanistan border, everything added to its charm. The guns manufactured in Srinagar adorned the houses of princes, the elite and ace hunters in various Indian states. The gunsmiths wielded power and influence and a whole locality in Srinagar came to be known as Bandook Khar Mohalla. It was a buzzing industry with orders that never seemed to dry up. In 1947, the industry had its first tryst with a downslide. Supplies from across the border dried out. Many gunsmiths fled and many gave up as the government ordered the closure of some gun factories. Some were restored, only to be curbed again in 1971, but the final blow came in 1989, when an armed insurgency erupted in Kashmir. Gun factories were first to go as everybody expected the worst with these 'dangerous' factories remaining open. Two years later, in 1992, government realised that militants would never use indigenous single or double barrel rifles as they themselves are equipped with sophisticated AK-47s and machine guns. The then Governor Jagmohan had asked the factories to resume work but there was a rider that they could produce only a specific number of guns. Only two factories have survived, to fulfill the dictates. "Ours is the industry which never encountered any security related problem and security agencies have given us clean chit," says Ahangar, one of the co-owners of the Subhana Gun factory in Srinagar. 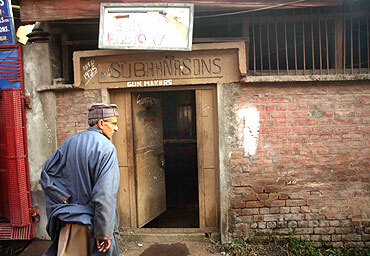 Subhana Gun factory is one of the oldest in Kashmir which has been in the business since 1925. The other surviving factory is the Zaroo gun factory, eastblished in 1940. Both factories work under a strict quota system. Subhana is allowed to produce just 300 guns in a year while Zaroo is allowed to make 540 guns. This quota is not enough for the gunsmiths to survive. "We complete the quota within three months and then we have to fend for ourselves," said Zahoor. "Our family needs cannot be fulfilled with this trade," says Zahoor. Bandook Khar Mohalla used to employ hundreds of gunsmiths, who worked relentlessly to produce these 'killer beauties'. "It was a bustling locality with people working everywhere, now it is a ghost town as the master gunsmiths are almost gone," said Zahoor. "Some have shifted to handicrafts while others are doing some other business. Those working are only ones who are too old to try anything else," Zahoor says. "The persons working at Zaroo Gun Factory are people from Bihar and Chandigarh, who come here in lieu of good money. We have to bring workers from outside at double the rate because nobody wants to come for just three months work," said Zahoor. Zahoor himself is certain that he will the last of his family to make guns,"Not in my dreams would I allow my children to take up this trade, they will do something better." In his generation, Zahoor saw the trade shifting from a primary occupation to a secondary job. The next generation will see it pushing towards extinction. The gunsmiths had pleaded with almost every leader and official to let them resume their work normally, but all such efforts have been in vain. Even after security agencies gave them a clean chit, their files havent moved. Security officials still feel apprehensive about the industry. "We know that the guns produced here have never been misused but the industry is burdened with too much sensitivity to let free," said a police official. The authorities hope that with the security situation fast improving, the problems associated with the industry will also be thing of the past. The gunsmiths allege that they are victims of discrimination. "We agree we are a militancy affected state, but how come the same industry is progressing by leaps and bounds in Jammu, while it's dwindling in the Kashmir valley. 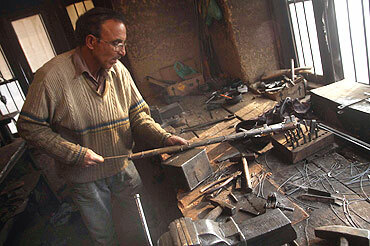 There are atleast 30 gun factories in Jammu, whose quota runs into thousands of guns each, with a periodic increase. If the factories in Jammu are allowed to run freely, why not gun factories in Kashmir?" 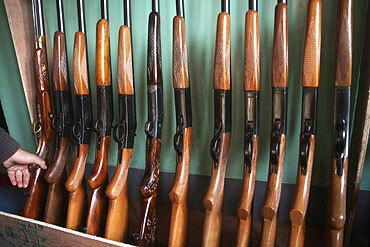 The guns produced are used for hunting and by private guards at banks. The entire supply is picked up by the central government. 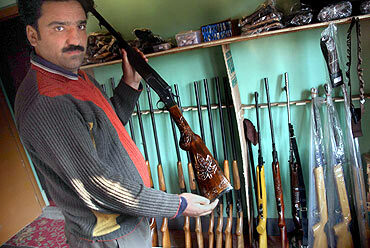 In Kashmir, an unwritten ban on the issuance of firearms has ensured that the gunsmiths have no buyers from the Valley. The ban on hunting has done no good either. The industry is also badly hit by the government's decision to deny any new license for setting up of a gun factory in Kashmir. Zahoor opines that given a chance the industry will provide employment to a lot of people and will again be a booming locality like its counterpart in Jammu. "We have the potential to manufacture ten times the present quota," says Zahoor. The factories have enough infrastructure to employ double the present staff and increase production by four times, but the government is unwilling to give them a green signal. These are guns for peace. The government should let them grow and see the benefits flowing down to people," said Zahoor. Even if their brethren in Pakistan and Afghanistan have progressed to anti-aircraft guns and rocket launchers, Kashmiris were stuck with their naive single and double barrels guns. But as the luck would have it, their future still is doomed.